Patricia Spears Jones, poet and BEI Emeritus Fellow, joins six other all-star female poets in a poetry reading to support the Democratic National Committee. Other featured poets include: Lee Ann Brown, Elaine Equi, Rachel Hadas, Trace Peterson, Larissa Shmalio, and the M.C. of the event Maggie Balistreri. 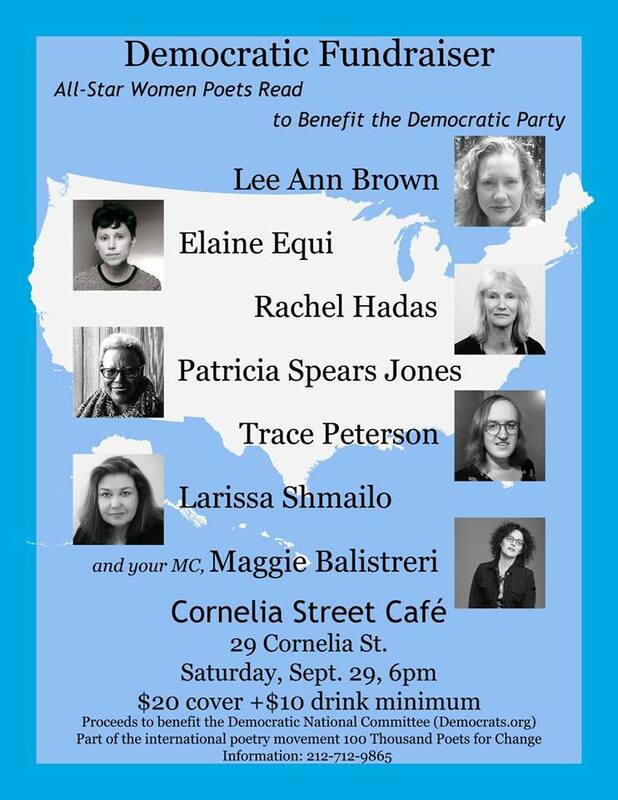 Show your support on Saturday, September 29 at 6pm at the Cornelia Street Cafe. There is a $20 cover and a $10 drink minimum. Come out and help these poets support a local business and the Democratic National Committee, part of the international poetry movement 100 Thousand Poets for Change. Elaine Equi teaches at New York University and in the MFA Program in Creative Writing at The New School. Widely published and anthologized, her work has appeared in The American Poetry Review, The Nation, The New Yorker, Tin House, Poetry, and in many editions of the Best American Poetry. Rachel Hadas is the author of many books of poetry, essays, and translations; her verse translations of Euripides’ two plays about Iphigenia are just out from Northwestern University Press, and “Poems for Camilla” is due out this fall from Measure Press. The recipient of many awards, she teaches at Rutgers University-Newark. Patricia Spears Jones is a poet and winner of the 2017 Jackson Poetry Prize from Poets and Writers. She is author of A Lucent Fire: New and Selected Poems (White Pine Press, 2015) which was Finalist for the PSA’s William Carlos Williams Prize and the Patterson Poetry Prize and featured a Pushcart Prize winning poem. She is in anthologies such as Of Poetry and Protest: From Emmett Till to Trayvon Martin; BAX: Best American Experimental Writing, and 2016: 2017 Pushcart Prize XLI. She received residencies at Virginia Center for Creative Arts (VCCA); Yaddo, The Rauschenberg Center, and Camargo Foundation in Cassis, France via the BAU Institute. Trace Peterson is a trans woman poet critic. Author of Since I Moved In (Chax Press, 2007), she is also founding editor and publisher of EOAGH, which has won two Lambda Literary Awards, including the first given in transgender poetry. She is coeditor of the anthology Troubling the Line: Trans and Genderqueer Poetry and Poetics (Nightboat Books, 2013) and coeditor of Arrive on Wave: Collected Poems of Gil Ott (Chax Press, 2016). Her second full-length book of poems is forthcoming from Ahsahta Press in 2020. Larissa Shmailo is a poet, novelist, translator, editor, anthologist, and critic. Her new novel is Sly Bang, forthcoming from Spuyten Duyvil in January 2019. She is the author of five poetry volumes and two poetry CDs; her latest poetry collection is Medusa’s Country (MadHat). Shmailo translated Victory over the Sun for the Los Angeles County Museum’s landmark reconstruction of the Futurist opera and edited the online anthology, Twenty-first Century Russian Poetry (Big Bridge). She is the winner of four New Century Awards for spoken word. Emcee Maggie Balistreri (@nycmaggie) is a namer and taxonomist and the author of The Evasion-English Dictionary expanded edition; A Balistreri Collection: abc poems; and There Was a Young Lady Who Swallowed a Lie (illustrated by Ryn Gargulinski). She also publishes as Maude Spekes.